One of the most amazing things about living in Florida is the absolute abundance of plants and wildlife. Even living in the city (Orlando), I can still look around me and find plants, animals, and insects. This place is just overflowing with life. Everywhere you go you can find weeds (I hate the term “weed”) poking up through the cracks in the pavement, or in between sections of the sidewalk. One of the more common weeds we see this time of year is purslane. Purslane Portulaca oleracea is a succulent, which means that one or more of its parts is swollen to allow for the accumulation of fluids. The plump part of purslane though is the leaf. Along with plump leaves, purslane has tiny yellow flowers and a strong stem. One of the major varieties I see around here even has red stems. Almost every place on Earth has a variety of purslane, and with its great taste and a high amount of nutrients, it has been eaten all over the world. The taste is mildly sour and it has a slightly chewy and crunchy texture. This plant is most commonly used as a raw green in salads or as a pot herb (meaning you cook it in a pot like Southern greens). The flowers and stems are edible as well as the leaves. This tiny plant is jam packed with nutrients. Even some nutrients, like omega-3 fatty acids, that are not typically found in the plant kingdom. It also has more beta carotene than spinach, as well as an incredible amounts of vitamin C, calcium, phosphorus, iron, magnesium and potassium. Though it is easy to find nutritional and culinary information on purslane, its uses as a medicinal herb are not quite as well known. In Traditional Chinese Medicine (TCM), purslane is used to improve both respiratory and circulatory function. In traditional European herbalism, it has been used to treat arthritis and other inflammation. It is known to be helpful in cases of scurvy, cataracts, heart disease, asthma, gingivitis, multiple sclerosis, and psoriasis. It is also a great immune booster. It has been suggested as a daily tonic for the reduction/prevention of headaches. Purslane contains at least two kinds of antioxidants that have been known to prevent cell mutation, so it can prove to be helpful in the prevention of cancers. 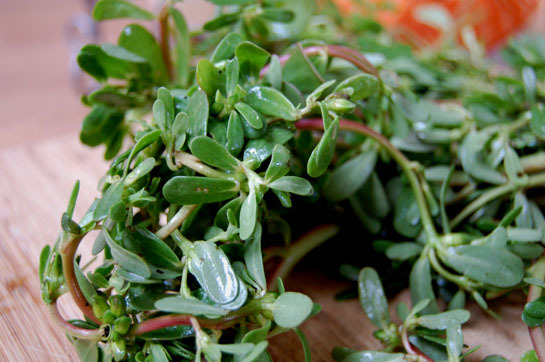 Purslane is believed to help balance the body’s insulin. It can also counter the negative effects of consuming too much caffeine, such as jitters and sleeplessness. It also contains antidepressant substances such as calcium, magnesium, potassium, phenylalanine, and tryptophan that have been known to help counter depression by moderating the chemicals that cause depression. There is one major warning that comes with this herb though. If you are prone to kidney stones, you want to avoid high doses of purslane as it contains oxalates which can cause stones to form in the kidneys. Herbal Inspired Drinks for a Happy 4th of July!